Our Abpromise guarantee covers the use of ab84191 in the following tested applications. 15% SDS-PAGE showing ab84191 at approximately 26.8kDa (3µg). 2. Read at excitation wavelengths 485 nm and emission 535 nm. 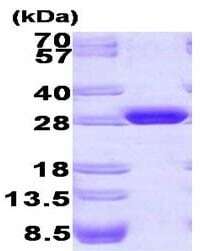 We have used this protein for Western blot applications. On a 4-12% Bis-Tris gel, the protein runs to the expected molecular weight and is readily detectable using multiple anti-GFP antibodies in our hands. We observed excellent signal linearity across a large range of GFP amounts (as shown in the image) by Western blot and have not observed loss of protein or change in apparent molecular weight following long term storage at -20 C.
We use this as a positive standard in our western blots to detect expressed GFP fusion proteins in HEK cells. Used the protein as a positive control in Western Blot of a GFP-tagged recombinant protein preparation. Result: good specific signal, no nonspecific bands detected. Block: TBS + 3 % milk 30 min. Antibody incubation: HRP-conjucated goat polyclonal to GFP (Abcam ab6663) in 1:2000 dilution, 60 min. Wash: 4 x 5 min TBS-T. Detection: 5 min incubation in TMB Liquid Substrate System (Sigma).